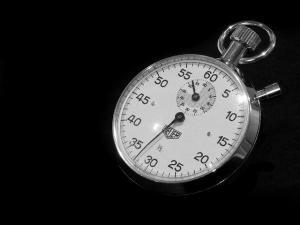 Q/A – It’s Not Really 15 Minutes! I just had a weird little question for you. My 15 minute study session isn’t ending up 15 minutes. Since setting up for the study session isn’t included it’s turning into 25 or 30 minutes. Is it supposed to be that way or am I messing something up? Well… I have a weird little answer for you. If you’re really just preparing for your study session in those extra 10-15 minutes then you’re not really screwing anything up. You might be wasting a little time with inefficient strategies but saying you’re screwing up is a bit of an overstatement. If you’re unintentionally using those extra 10-15 minutes for any amount of recall based studying and you’re calling it prep work then, yes, you’re screwing it up. So… if you’re making flash cards during those 15 minutes and trying to memorize them at the same time then you’re screwing up. If you’re just writing through flash cards as quick as you can then you’re not screwing up. The problem with this inconsistency is that is completely ruins any attempts to measure what you’re doing. You can’t tell whether your strategy is working if you’re half studying and half prepping for studying. Many people work on prep time in very different ways. I try not to go too deep into the specifics because different people have different lifestyles and preferences. Some people spend 15 minutes before the session preparing their study material. Some students spend an extra hour a week randomly preparing stuff. Some students only use free time in class to prepare for studying. Whatever way you’re able to follow through with consistently is probably best. Following through is more important than 5 minutes here or there. I recommend keeping prep time as short as practically possible for you and your own preferences. Adding an extra 15 minutes to your daily study routine adds up into hours real quick. I don’t know about you but I prefer not to waste my free time doing boring class prep work. Work during those periods as if you’re getting a flat fee for it. Any extra time you spend is lost. Some students completely skip prep work. Depending on the specific subject I’m studying, I sometimes do that as well. If you can just pick up your notes, textbook, or whatever and start studying you’ll save yourself a whole lot of trouble. It may cost you a couple points but adding up those extra hours you spend to do prep work, it may be worth it. At the very least, try not to go overboard with the prep work. In my experience, 15 minutes every study session is longer than usual. I’ve used somewhere around that long before but looking back, knowing what I know now, I think it was a little bit excessive. Of course, then you have to look at how that prep work is being used. If you take 15 minutes to pull out your textbook and find a pencil then you’re wasting it. If you’re using that 15 minutes to furiously write flash cards then you’re at least getting a little bit of study material exposure. It’s not ideal but at least it’s not completely wasted time. 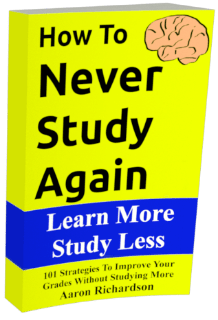 Do you want to know how to study in less than 15 minutes a night while scoring higher than 90% of your classmates? That’s what this blog is all about. Read the ebooks in the sidebar, check out the archives, and join the thousands of readers following along. This is really helpful information i will link this post to my blog, keep posting!